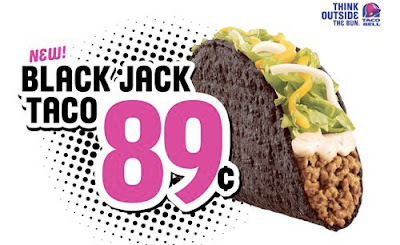 Always Carrying Coupons: Free Black Jack Taco at Taco Bell on Halloween! Never missing out on great deals and coupons! Free Black Jack Taco at Taco Bell on Halloween! Free Black Jack Taco at all Taco Bell locations on Halloween from 6pm - midnight!!! Don't Understand? This might help. B1G1 = Buy one get one free. Also BOGO. ESC = Easy Saver Coupon. Found in the Walgreens Easy Saver rebate books in store. ESR = Easy Saver Rebate. Item that has a rebate offered in the monthly Walgreens Easy Saver book available in store. FAR = Free After Rebate. MIR = Mail in Rebate. MM= Money Maker, the store will pay you to take home this item! RP = Red Plum. One of the coupon inserts in your Sunday paper. RR = Register Reward, earned at Walgreens and can be used on a future purchase. SS = SmartSource. Another coupon insert that can be found in your Sunday paper. V = Valassis. Yet another coupon insert you may find in your Sunday paper. WYB = When You Buy. As in the item is free when you buy XYZ. Just copy and paste my button.